England have been crowned Six Nations champions and have taken the Grand Slam for the first time since 2012 after a strong 7-34 win over Ireland. Both sides were going for the title in the final game but the visitors took their chances brilliantly to score five excellent tries in blustery conditions. Ireland’s started on the back foot with England pressing hard, but the Irish scrum started strongly enough to keep them in it in the opening exchanges. But it was all England as far as territory was concerned. Centre Emily Scarratt missed a penalty in the strong wind after ten minutes but she had a huge hand in the lead up to the first try with a lovely floated pass to Amy Wilson-Hardy to finish off after 17 minutes. 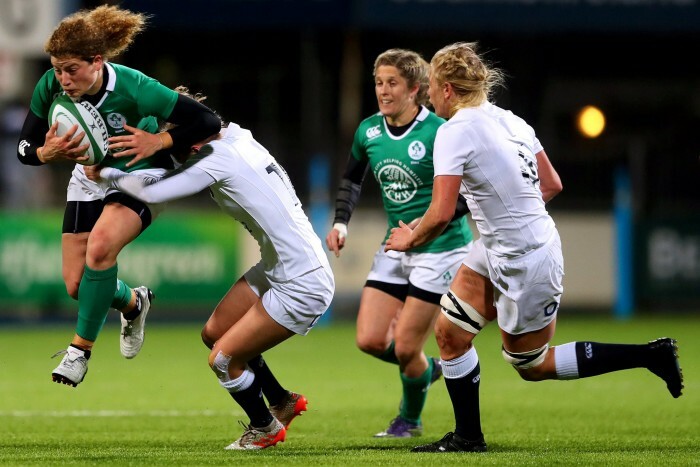 Ireland, playing into a difficult first half breeze, upped their game, especially at the set piece, where their scrum and line out were superior, but England enjoyed most of the territory with Harriet Millar-Mills and Marlie Packer forcing the Irish defence to work incredibly hard. Ireland really should have levelled it up before the break with two drives over the try line, but Packer and Sarah Hunter stopped Sene Naoupu and then Paula Fitzpatrick was held up and England managed to boot it clear to keep it at 0-5 at the break. England brought on Laura Keates to shore up their scrum in the second half and though Ireland started impressively it was England’s defence this time which powered through with Packer, Alex Matthews and Millar-Mills to the fore. Ireland lost Claire Molloy to concussion in a big blow having played so well so far, and another turnover from Packer helped England to get within a metre. England were held up but came again and again. Hunter was almost over having hit a great line but once Packer took in three defenders, Keates powered over on her 60th cap. Having just come off the bench, Mairead Coyne was then carded for a deliberate knock on after a fine break from Scarratt, who slotted the conversion to make it 0-13. England then made it 20 points after a poor kick from Nora Stapleton helped England away and Scarratt’s lovely offload saw Amy Cockayne run 40 metres to dot down. Ireland came back though with some fantastic direct play up front with Leah Lyons eventually dotting down but England came straight back at them with some wonderful offloading from Danielle Waterman and Bianca Blackburn helping Scarratt to find space and she raced over to put the game beyond doubt. Ireland: Kim Flood (Railway Union / Leinster) (for Coyne 52) Hannah Tyrrell (Old Belvedere / Leinster), Jenny Murphy (Old Belvedere / Leinster), Sene Naoupu (Aylesford Bulls), Alison Miller (Old Belvedere / Connacht), Nora Stapleton (Old Belvedere / Leinster), Larissa Muldoon (Railway Union); Lindsay Peat (Railway Union / Leinster), Leah Lyons (Highfield / Munster), Ailis Egan (Old Belvedere / Leinster), Sophie Spence (Old Belvedere / Leinster), Marie-Louise Reilly (Old Belvedere / Leinster), Ciara Griffin (UL Bohemians / Munster), Claire Molloy (Bristol / Connacht), Paula Fitzpatrick (St. Mary’s College / Leinster) (C). England: 15 Danielle Waterman, 14 Amy Wilson Hardy, 13 Emily Scarratt, 12 Amber Reed , 11 Kay Wilson, 10 Emily Scott, 9 La Toya Mason, 1 Rochelle Clark, 2 Amy Cokayne, 3 Justine Lucas, 4 Tamara Taylor, 5 Harriet Millar-Mills, 6 Alex Matthews, 7 Marlie Packer, 8 Sarah Hunter (c).